Any dynamic mattress product worth consideration for use in acute care hospitals must have some clinical evidence supporting their efficacy. Supporting clinical information is an essential qualifier in providing evidence and information of the effects of a particular product in everyday clinical use. Pegasus has a rich history when it comes to clinically proven products and has consistently shown using evidence, research and facts that the Pegasus range of dynamic systems are clinically proven in the prevention and treatment of all grades pressure injuries. Our complete product range is fully supported by substantial clinical evidence alongside proven clinical results from decades of use in healthcare facilities in Australia and worldwide. The Pegasus 3-cell cycle Airwave Therapy systems are clinically proven to prevent of pressure ulcers in patients assessed to be at High to Very High Risk of pressure ulcer development as well as for accelerating the healing of established pressure ulcers. The 3-cell cycle is designed to support two-thirds of the body at any one time, allowing the mattress to be soft and comfortable without compromising its clinical efficacy. This support provides a bridge to allow the deflating cell to drop clear of the patient interface ensuring optimum pressure elimination in the area of the deflated cell. Airwave Therapy mimics the method by which the body usually prevents pressure damage with the complete removal of load from previously compressed skin and soft tissue. This complete removal of load has been demonstrated in interface pressure studies and the beneficial physiological consequences quantified both in terms of blood supply, lymph flow and preventing increases in surface temperature. This total pressure elimination also known as ‘zero pressure’ has been at the heart of a small number of products for over 30 years dating back to the grandfather of alternating pressure in 1985 the Airwave Therapy System, then the Cairwave and more recently the NoDec 3 Airstream. Over this time, these Pegasus Airwave Therapy systems have been the most studied of all support surfaces and are still considered the gold standard against which all other mattress systems are compared. Since the original development, the mattress design concept has not altered other than in the materials from which it is made. The mattress consists of a two layers of transversely running air cells; each layer comprising 18 large diameter air cells that have been ultrasonically welded together. Each layer is separated by 2 permanently inflated air cells that run lengthwise at the sides of the mattress to provide a firm edge for patient support and safety during transfers. The pump unit contains powerful piston compressors, where the air cells are inflated and deflated in a 1-in-3 cell alternating 7.5 minute cycle. The 3-cell cycle Airwave Therapy products offered by Pegasus operate on a 7.5 minute cycle which facilitates complete pressure relief for up to 8 times an hour. This optimum frequency is firmly based on research, which indicates that if spontaneous movement during sleep exceeds 8 times each hour, tissue damage is unlikely to occur. Exton-Smith studied the spontaneous movements of 50 patients during a 7-hour period at night. Patients in this study who changed position more than 50 times in the 7 hours observation period did not develop a single pressure ulcer whereas those who made less than 10 movements in this period had a 90% pressure ulcer incidence. Therefore it was determined that the frequency of complete pressure relief should be at least 8 times per hour. This work was a unique series of experiments designed to compare the effects of a static mattress and 3-cell cycle technology upon lymph flow. While resting upon the 3-cell cycle mattress lymph flow increased over 300% compared with the flow rate upon the non-dynamic mattress. Results support the hypothesis that the Airwave’s action increased the lymph flow compared to a standard hospital mattress. The dynamic cycle may act to aid the pumping action of lymphatics by reducing pressure which would otherwise collapse and compress lymphatics leading to local oedema and tissue swelling. Maximized nutrition by an intensive daily program. 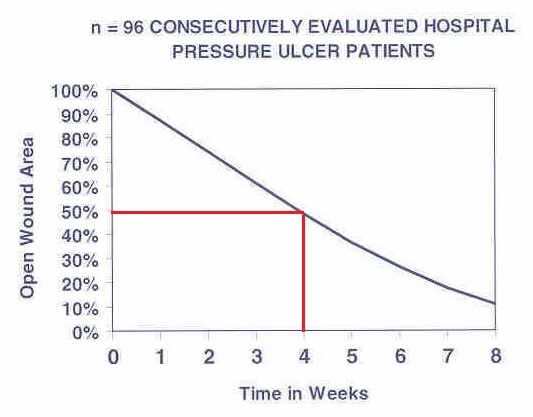 The initial rate of healing of pressure ulcers was 12% per week. On average the wound size of all pressure ulcers was reduced by 50% after 4 weeks of treatment. By using the 3-cell, 7.5 minute cycle of the Cairwave Therapy System as part of a standard protocol of care it is possible to reduce the size of even the most severe pressure ulcers by 50% after 4 weeks of treatment. This includes a subset of 10 obese patients, mean BMI 41 (range 31- 74), with severe stage 3 or 4 wounds, limited mobility, low albumin and complicating co-morbidities. In this study, the superior effects of the 3-cell cycle mattress were reported using measurements of interface pressure and superficial blood flow (transcutaneous availability of oxygen and carbon dioxide) among an acutely ill patient population. In this investigation, the 3-cell cycle support surface was the sole tested support surface ‘which is really capable of temporarily generating pressure values in the region of zero, so that hyperaemia of the previously underperfused areas is possible’. The rapid changes in tissue compression offered by 3-cell cycle support surfaces ‘showed a greater fluctuation between minimum and maximum values for the transcutaneous oxygen measurements’ indicating that rapid changes in interface pressure do affect local blood flow. In this invasive blood flow study subcutaneous tissue oxygen tension increased above off-loaded baseline in all five subjects when resting on a three cell cycle support surface, with the mean increase being 45%. It was also shown that subcutaneous temperature, which approaches core temperature in a standard mattress, is approximately 1°C cooler with use of alternating pressure. 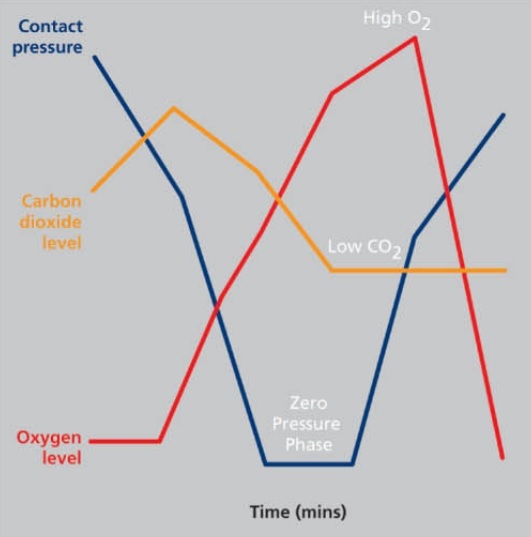 This implies that alternating pressure provides a superior match between oxygen supply and demand at sites where pressure might otherwise be allowed to persist. 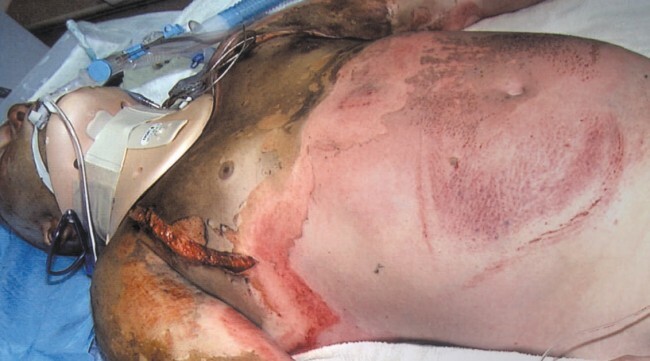 a range of life-threatening complications in the post-burn period. Examples of which are restricted mobility, respiratory failure, acute haemodynamic instability, metabolic instability, nutritional imbalance, infection, scarring and loss of function. Most of these factors are also those associated with the highest risk of pressure ulcer formation; consequently this group are exceptionally vulnerable to pressure damage. For the burn patient a pressure ulcer can be devastating as it may provide a focus for life-threatening infection and may cause a delay in essential reconstructive surgery. Plus any increase in length of stay has a significant cost to the healthcare provider. The Joseph M. Still, Burn Center in Augusta, Georgia had encountered problems with pressure ulcers in burn patients, in spite of using a wide variety of preventive measures. This retrospective study evaluates the outcome of patients treated with the Pegasus Cairwave mattress in 186 patients. The treated group included patients with large, burns, patients in traction, ventilator dependent patients, obese patients, patients with stool or urinary incontinence, and those who were malnourished or cachectic. Over a 29-month period 186 (13.4%) of 1,390 acutely burned patients, believed to be at high risk for the development of pressure ulcers, were placed on a 3-cell cycle mattress. Other patients were treated in the standard hospital bed. Care was otherwise the same. No pressure ulcers developed in any of the patients treated on the 3-cell cycle mattress. Based on data reported, the Pegasus Cairwave system has been shown to be effective in reducing the incidence of pressure ulcers in burn patients. By comparison with results of reported studies in non-burn patients, the length of stay and treatment costs of burn unit patients should also be reduced when these mattresses are used as part of a standard treatment program. A prospective, clinical outcome study was undertaken in a critical care environment to provide evidence of the effectiveness of a unique pressure-relieving (PR) alternating mattress system in both the prevention and treatment of pressure ulcers in an extremely vulnerable population. 160 critically ill patients were included across five critical care settings in the UK. 87.5% of the patients were ventilated and 93.1% were totally immobile. 30 patients had existing tissue damage, of these 14 (46.7%) improved, 80% of the pre-existing superficial pressure ulcers healed.